It’s October, which means it’s supposedly a time of mists and mellow fruitfulness. I’m not sure about the mists, and as for the mellow fruitfulness, all I can say is that my greenhouse tomatoes are still looking decidedly green and unappetising. I had such hope for them when I sowed the seeds back in March. Ah well, there’s always chutney as a standby – again. So, what else does October have in store? Of course, Bake Off is already back on TV (sadly without any recipes for what to do with a ton of green tomatoes!). In terms of events to plan for, we’ve got Diwali just a few weeks away, followed by half-term at the end of the month, then Halloween and then Bonfire Night. After that little lot all attention switches to the big event that happens every year in December. Don’t worry, I’m not going to name it, but it’s a shocking revelation to realise that there’s just a little over 10 weeks until the big day. Seems like an age but you know it’s going to be on top of us before we know it. One lesson I’ve learned from previous years is to start planning as soon as possible to give yourself as big a head-start as you can, and that, with everything else going on, requires some pretty good time management. 24% of respondents are NOT using any CRM system … and of those that do use CRM, up to 60% fail to meet expectations. Some of the benefits to be gained from using a CRM system include the following key point: Act! 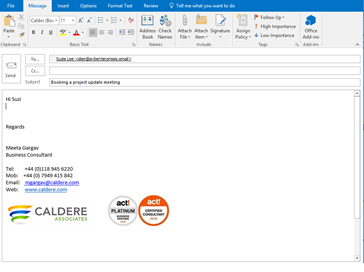 is fully integrated with Microsoft Outlook, which means we can send emails straight from Act! Think of how much time that could save. In order to do this, you’ll need to set it up as follows. 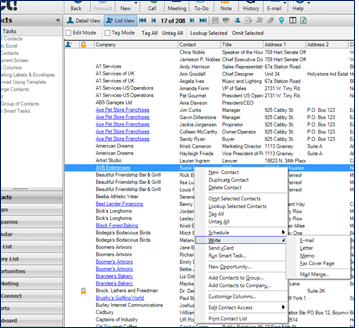 From the Contact List View, highlight the contact name that you want to email. Right click on that name. This will bring up the shortcut menu where you need to select Write -> Email. This will then open up a ready addressed email for you to write. 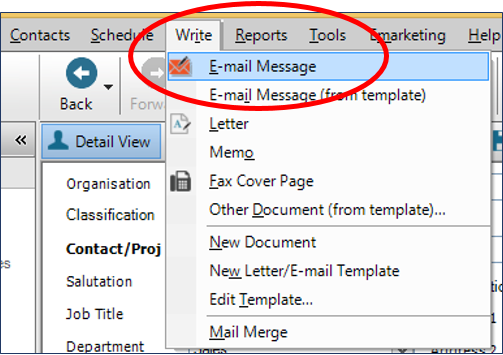 Once you have finished writing the email, click Send and, hey presto, you will automatically be returned to your Act! database. 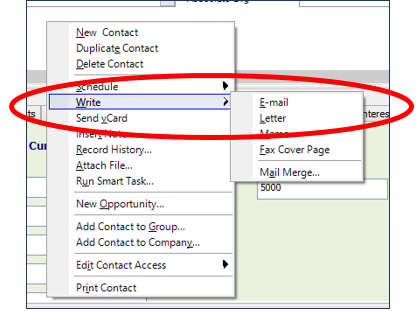 What’s more, the email you have just written and sent will be attached to the contact card within the Act! database. Nothing could be simpler. There are a few other ways to access email from Act!. Try each of them and see which one you prefer. Hope it helps you save a little time. Meanwhile, I need to start preparing myself for Diwali. Oh, and maybe I should think about planting my tomatoes a little earlier next year. Now then where did I put my recipe for green tomato chutney?